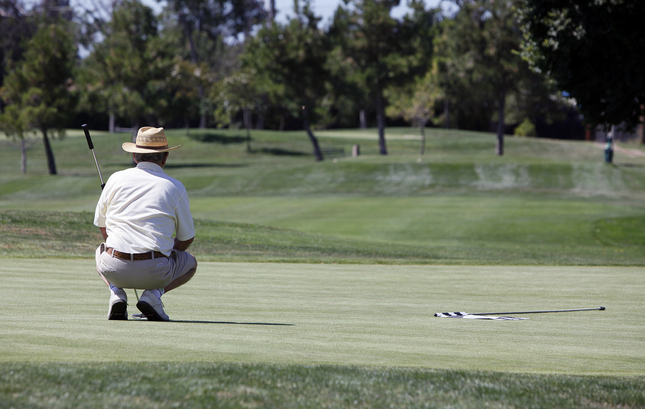 The city of San Jose, CA, weighs closing a golf course to stem financial losses. SAN JOSE — San Jose’s two newest golf courses are likely to remain money-losers for years to come, according to a new city audit that cited their high debt costs and the game’s fading popularity and suggested selling all or part of one or turning some links into soccer, softball or baseball fields. San Jose built the two courses, Rancho del Pueblo and Los Lagos, early last decade amid bullish predictions about the sport’s growth. But they’ve never earned enough to cover operating and debt costs, draining more than $2 million from the city each year to subsidize them. The audit, which the City Council will consider next month, is renewing cries at City Hall to explore other options. “We have these courses open, but very few people play in them and we can’t be subsidizing them forever,” said Councilman Tam Nguyen, whose district includes the money-losing Los Lagos course, which opened in 2002. But the city’s golf courses also have their defenders who argue they provide affordable access to the sport. Longtime golfer Bill Hubka, 76, said losing some of the city’s links would drive golfers to play out of town and will hurt numerous local tournament groups. year, to cover operating losses and debt. That number is expected to reach $2.6 million this year. 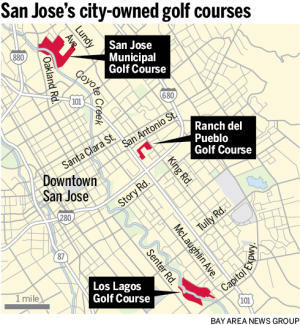 The city owns three courses: Los Lagos, Rancho del Pueblo and San Jose Municipal Golf Course. But only San Jose Muni, which opened in 1968 and has no remaining debt costs, is making money — about $400,000 a year — for the city. The other two have seen revenues drop dramatically as golf play decreased by 28 percent at the 180-acre, 18-hole Los Lagos, and 42 percent for Rancho del Pueblo, which has nine holes spanning 31 acres. Both golf courses are losing about $300,000 a year, and face a mountain of debt — $18.3 million for Los Lagos and $4.5 million for Rancho del Pueblo. pay off their debt, reconfigure the land for a soccer, softball or baseball fields, or keep all three courses open and try to reduce annual losses by boosting usage. But Los Lagos would need to grow usage by 60 percent and Rancho by 140 percent to fully cover operating losses and debt service, the report said. That seems unlikely given the competition from at least 23 other golf courses within 25 miles of downtown San Jose and a nationwide decline in golf play, the auditor said. Councilman Donald Rocha, whose children are involved with softball, soccer and other youth sports, said there’s a shortage of fields and complexes for games. But he’s not convinced the embattled golf courses are the right spots. He said Rancho del Pueblo would be “my last choice” for field conversion. This entry was posted in Golf, Golf Course Closure, Golf Industry and tagged ArrowCreek 411, ArrowCreek411, Golf, Golf Course, Golf Course Closure. Bookmark the permalink.